"Misanthrope" redirects here. For the Molière comedy, see Le Misanthrope. For the French metal band, see Misanthrope (band). For the album by American hard rock band DED, see Mis.an.thrope. Misanthropy is the general hatred, dislike, distrust or contempt of the human species or human nature. A misanthrope or misanthropist is someone who holds such views or feelings. The word's origin is from the Greek words μῖσος (misos, "hatred") and ἄνθρωπος (anthrōpos, "man, human"). The condition is often confused with asociality. Gustave Flaubert once declared that he would "die of suppressed rage at the folly of [his] fellow men." Misanthropy has also been ascribed to a number of writers of satire, such as William S. Gilbert ("I hate my fellow-man") and William Shakespeare (Timon of Athens). Jonathan Swift is widely believed to have been misanthropic (see A Tale of a Tub and, most especially, Book IV of Gulliver's Travels). Poet Philip Larkin has been described as a misanthrope. 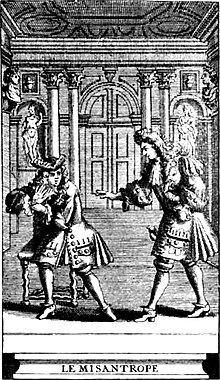 Molière's play The Misanthrope is one of the more famous French plays on this topic. Less famous, but more contemporary is the 1971 play by Françoise Dorin, Un sale égoïste (A Filthy Egoist) which takes the point of view of the misanthrope and entices the viewer to understand his motives. Michelangelo has been called a misanthrope. Don Van Vliet (commonly known as Captain Beefheart) has been described as a misanthrope, with close friend Kristine McKenna stating that he "thought human beings were the worst species that was ever dreamed up". Morrissey, a songwriter, has been dubbed "pop's most famous misanthrope". Fernando Pessoa's "factless autobiography" The Book of Disquiet has been described as misanthropic. The pre-Socratic philosopher Heraclitus was by various accounts a misanthrope and a loner who had little patience for human society. In a fragment, the philosopher complained that "people [were] forever without understanding" of what was, in his view, the nature of reality. In Western philosophy, misanthropy has been connected to isolation from human society. In Plato's Phaedo, Socrates describes a misanthrope in relation to his fellow man: "Misanthropy develops when without art one puts complete trust in somebody thinking the man absolutely true and sound and reliable and then a little later discovers him to be bad and unreliable ... and when it happens to someone often ... he ends up ... hating everyone." Misanthropy, then, is presented as a potential result of thwarted expectations or even excessively naïve optimism, since Plato argues that "art" would have allowed the potential misanthrope to recognize that the majority of men are to be found in between good and evil. Aristotle follows a more ontological route: the misanthrope, as an essentially solitary man, is not a man at all: he must be a beast or a god, a view reflected in the Renaissance view of misanthropy as a "beast-like state". There is a difference between philosophical pessimism and misanthropy. Immanuel Kant said that "Of the crooked timber of humanity, no straight thing can ever be made", and yet this was not an expression of the uselessness of mankind itself. Kant further stated that hatred of mankind can take two distinctive forms: aversion from men (Anthropophobia) and enmity towards them. The condition can arise partly from dislike and partly from ill-will. Martin Heidegger has also been said to show misanthropy in his concern of the "they"—the tendency of people to conform to one view, which no one has really thought through, but is just followed because, "they say so". This might be thought of as more a criticism of conformity than of people in general. Unlike Schopenhauer, Heidegger was opposed to any systematic ethics; however, in some of his later thought, he does see the possibility of harmony between people, as part of the four-fold, mortals, gods, earth, and sky. In the Judeo philosophies (800–1400), the Jewish philosopher Saadia Gaon uses the Platonic idea that the self-isolated man is dehumanized by friendlessness to argue against the misanthropy of anchorite asceticism and reclusiveness. In Nautilus, Leonard Mlodinow writes of Isaac Newton, "It would be nice to be able to say that this giant of intellect was an empathetic, agreeable man, but if he had any such tendencies he did a good job suppressing them and coming off as an arrogant misanthrope." Species dysphoria - the dislike of being human, and the desire to be another animal, or being. ^ The Letters of Gustave Flaubert: 1857-1880. Harvard University Press. 1982. p. xiv. ISBN 0674526406. ^ Raban, Jonathan (October 17, 1992). "Books: Mr Miseryguts: Philip Larkin's letters show all the grim humor that was a hallmark of his great poems, but, as the years pass, they also chart the true depths of his misanthropy and despair". The Independent. Retrieved June 18, 2017. ^ Cromelin, Richard (December 18, 2010). "Don Van Vliet dies at 69; avant-garde rock musician known as Captain Beefheart". Los Angeles Times. Retrieved June 18, 2017. ^ Hawking, Tom (July 15, 2014). "The Most Morrissey Lyrics From Morrissey's New Album". Flavorwire. Retrieved June 30, 2017. ^ "Heraclitus_of_Ephesus". Ancient History Encyclopedia. Retrieved 2017-12-08. ^ 1953-, Chitwood, Ava, (2004). Death by philosophy : the biographical tradition in the life and death of the archaic philosophers Empedocles, Heraclitus, and Democritus. Ann Arbor: University of Michigan Press. p. 80. ISBN 0472113887. OCLC 54988783. ^ Stern, Paul (1993). Socratic Rationalism and Political Philosophy: An Interpretation of Plato's Phaedo. SUNY Press. p. 94. ISBN 978-0-7914-1573-3. ^ Jowett, John (2004). The Oxford Shakespeare: The Life of Timon of Athens. Oxford UP. p. 29. ISBN 978-0-19-281497-5. ^ a b Immanuel Kant (2001-03-19). Lectures on Ethics. Cambridge University Press. p. 191. ISBN 978-0-521-78804-5. ^ McLoughlin, Gavin (2003). "Friendliness; and my fight against it". Touchstone Press: 2–6. ^ Goodman, Lenn Evan (1999). Jewish and Islamic Philosophy: Crosspollinations in the Classic Age. Edinburgh University Press. pp. 25–6. ^ Doughty, Howard A. "What's Yours Is Mine: Against the Sharing Economy." The Innovation Journal 21.1 (2016): 1. ^ Mlodinow, Leonard (November 27, 2014). "The Loneliest Genius". Nautilus. Retrieved June 18, 2017. Look up misanthropy in Wiktionary, the free dictionary.